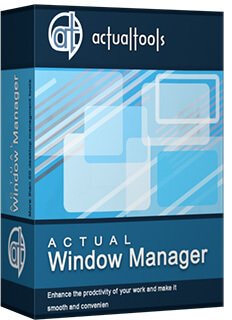 Actual Window Manager is a desktop organization application which introduces window controls and also automatic general window operations. Features include placing windows to the required place, sizing them as they should be, keeping the important windows always-on-top of others, and minimizing (either normally, or to the tray/screen), rolling up, making semi-transparent, and closing the inactive windows so removing them from your way. Operations can be done in a click on the title buttons which are added to the standard minimize, maximize, or close buttons after the installation. In addition to buttons, users can set up specific settings to be applied to predefined windows automatically. Clipboard Manager - improves Windows clipboard functionality with 2 additional features: Clipboard Templates and Clipboard History. Desktop Divider - allows you to split the entire large desktop or each monitor into several non-intersecting areas (tiles). File Folders - improves Windows folders navigation adding two additional title buttons. Individual Settings for Each Window - allows you to set individual settings for desired window, folder, or program. Multiple Monitors - greatly improves your multi-monitor environment adding additional fully-functional taskbars and other useful tools. Additional Title Buttons - adds additional buttons, such as minimize to tray, stay on top, roll up, etc, to the title bar of each window. Virtual Desktops - allows you to use unlimited number of virtual desktops on one or several monitors.